At Christ United, we hold Confirmation for 7th grade students and older every January through April. Each Confirmation season, there will be a Kick-Off, 10-13 classes, and a Service Project. Your student should expect to meet with their Confirmation class every Sunday morning or Friday evening on a weekly basis during the Confirmation process (11 meetings). We believe Confirmation is a vital part of our students’ faith journey and a priority should be placed on these meetings. We do ask that students do not miss more than 2 Confirmation activities which include Sunday morning (or Friday evening) classes and a Confirmation service project. Should you have any questions, please contact Stefani Reed-Meyer. We are excited to be a part of your student’s life during this important time! * New Opportunity: Friday Evening Confirmation Classes are offered, see below. *Required paperwork found at bottom of webpage. The 2019 class of confirmands will kick-off the beginning of Confirmation on January 11th at 6:30 PM. Students will meet in the Sports & Rec Center Loft while parents attend a Parent Meeting in the same location. This is a time for our students to get to know one another, to begin their sessions and to dive deeper into their faith. Attendance at Kick-Off is required for all students. Students will meet on Sunday mornings throughout the Spring semester for Confirmation class at 8:30 AM in the Sports & Rec Center Loft. All parents are encouraged to attend our parent class on Sunday mornings at 8:30 AM in the Sports & Rec Center Loft. This is a great chance for our parents to meet one another and to learn what their student is learning in Confirmation. Because we know schedules can be hectic, we offer a Friday evening Confirmation class which can be taken as a make-up class the Friday after a Sunday morning absence. It can also be taken for the full duration of Confirmation instead of a Sunday morning class. Students will meet on Friday evenings throughout the Spring semester for Confirmation class at 7 PM in the Sports & Rec Center S214. For more information about this new opportunity, please contact Stefani Reed-Meyer. This is an opportunity for our students to put what they’ve learned in class into action on March 30th, 9 – 12 PM. The students will be preparing meal packets for the Kids Against Hunger organization. If possible, youth are asked to bring $5 (or more if you’d like) to help cover supplies. This is a requirement for all Confirmation students. Please contact Stefani Reed-Meyer if you are unable to attend. Students are encouraged to join us on April 19 in the Sports & Rec Center Loft to watch “The Gospel of John”. This is a time to be together with fellow students on Good Friday. We will meet from 8 – 10 PM and provide snacks. The Confirmation rehearsal is scheduled for April 25 (Thursday) from 6 – 6:45 PM in the Sanctuary. Christ United’s clergy will speak to the entire Confirmation class in a relaxed setting and answer any questions that youth or parents may want to ask. We will also have a short run-through/rehearsal of Confirmation Sunday to go over placement, seating and other details youth and parents need to know about the big day. *Please note youth and parents need to be present at this gathering. Let the fun begin! After several weeks of morning Confirmation classes, a service project, an hour of rehearsal and more, it’s time to play. On Thursday, April 25, following the rehearsal, we will celebrate at the Confirmation Bash at PINSTACK from 7 – 8:30 PM. There is no cost for this event, but parents are asked to drop-off and pick-up their students at PINSTACK. 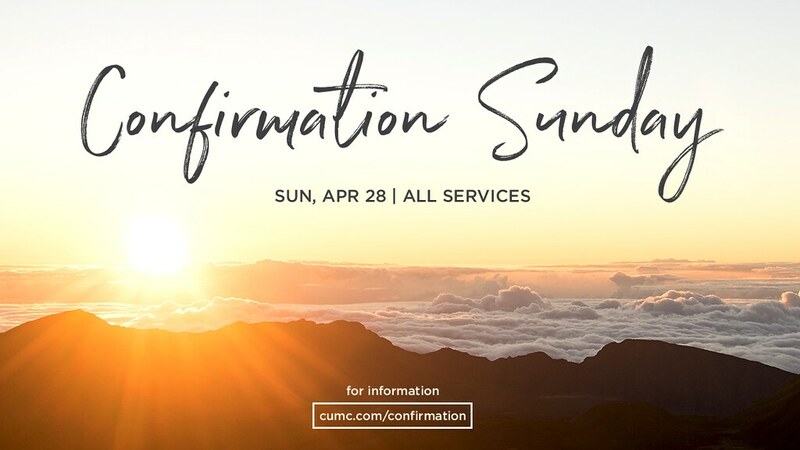 Confirmation will be held on April 28; youth can be confirmed in any of the traditional services (8:45, 9:45 or 11 AM) or the Table of Grace modern service. Be sure to invite friends, family, and their faith partners to this special day. Youth should meet in the youth choir room (behind the sanctuary choir loft) or in Trinity Hall (Table of Grace) fifteen minutes prior to the service that they are being confirmed in for donuts and preparation/instruction for their service.